My daughter had loose motions last week. I was completely messed up. Every mom know it well, how difficult it is when her baby is in smallest of trouble. She pooped 8-9 times in a day’s time. I live in Virar (thane,Mumbai) and my bad luck that almost all the doctors here take a day off from work on this particular day.They only come out in case of extreme emergency. I called my mom to discuss my concern and she, from her khazana suggested me a home remedy for loose motions.I would definitely like to share with you all as this is something which gave relief to my child and of course calmness to my heart. 1)Take two tablespoons of honey . 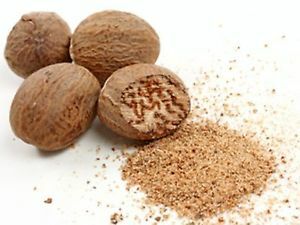 2) Put some nutmeg powder(jaiphal powder). 4) Give it to the baby.Half of it at that time only and then in small amounts in regular intervals.Warm the honey nutmeg paste,every time u make it lick the baby. It worked for us and hope it works for you as well. This entry was posted in Article and tagged babies, diarrhea, Home remedies for loose motions, Home remedy for babies, Home remedy for loose motions, honey, jaiphal, jaiphal for loose motion, loose motion in babies, loose motions, nutmeg by ranubhatt. Bookmark the permalink. Next → Next post: Be a good husband to your pregnant!